Parking; the bugbear of Planners, politicians, citizens, visitors and businesses a like. Very few topics can spark heated debates as parking and where to park inside an urban area. Even in cities that have ‘car-free’ City or Metropolitan Centres the car will be around with us for a very long time. So with whole-scale prohibition not going to work (not even Japan has done this with its very restrictive policies) and our current free for all parking everywhere equally not going to work we need to look at a middle ground. Enter reinventing the parking equation. Even if we got rid of all Minimum Parking Requirements out of the Unitary Plan (a minimum our Government should be doing and enforcing) developments would still have the option to provide parking (given we are not also writing up Parking as a Prohibited Activity). However, the common tendency especially with our supermarkets to provide a sea of car parks at between the road and the retail unit (sitting way down the back itself) or have Big Box retail building in a square with parking in the core and their backs to the road (Manukau Supa Centre) is unacceptable in a urban centre like Auckland and how we deal with retail and parking needs to change. That said I am noticing in South Auckland that new developments (apart from Supermarkets again (geez guys catch up with the times) are building their retail outlets roadside with the entrances to the stores both roadside and parking side which is located in the core of the development. This means any sea of parking is well inside the retail development for those who might need to drive while the opportunity for walk ups of transit use is also catered for given retail entrances are also roadside. It also just looks more pleasing to the eye seeing the buildings and landscaping roadside rather than a big sea of parking that again supermarkets are known to do and need to equally stop. Can Walkable Parking help end parking minimums? At first glance, parking minimums (also known as minimum parking requirements or parking norms or parking ratio standards) and Walkable Parking don’t seem closely connected. But I will argue that parking reformers have a huge opportunity here. Embracing Walkable Parking may be much more useful for ending parking minimums than most of us have realized. I need to explain what Walkable Parking is. In brief, ‘Walkable Parking’ is a mindset in parking policy in which the ideal is ‘park-once-and-walk’ areas in which most parking is open to the public and serves the whole area. However, that definition probably doesn’t clear it up enough for most people. To give you a more detailed picture, I will start by explaining the parking situation and approach that is the opposite extreme from Walkable Parking. Think about non-residential parts of the outer suburbs of most cities, places full of large suburban shopping centers, campus style business parks, big box stores, expansive and isolated industrial areas. North America has more than its share of such landscapes but even developing countries typically have some areas on their urban peripheries that are being planned like this. These are not walkable places. Just about every building is set back from the road on a very large plot of land with a wide frontage along the road. So, from any particular building, you only have very few other buildings that are within an easy walk. Each building needs its own onsite parking because no one willingly walks in these landscapes. The planning code also usually has parking minimums that require plentiful parking with each building in these areas (although arguably developers would build a lot of parking even without the parking minimums, which is what we see in car-dependent ‘out-of-town’ developments in England where parking minimums were more-or-less abolished). Nevertheless, parking minimums seem to make sense in car dependent areas like this. They seem a natural fit. This is their natural habitat. Things look very different in the dense mixed-use central areas of most cities, whether you’re in Asia, the Americas, Europe, Africa or wherever. You can read the rest of the post here: Can Walkable Parking help end parking minimums? Retrofitting existing development with their parking lots to mixed use as seen above is one way to get better urban geography outcomes without majorly sacrificing convenience of all transport modes. If anything having Park-once-and-walk district policies especially in our Metropolitan Centres would assist trade competition as well as general health of the population and better urban design outcomes. Going Cold Turkey with removal of Parking Minimums can be done as simple as the Environment Minister signing an Order In Council (looking at the Resource Management Act debate with new policy statements coming out on urban development this might very well happen). However, even if such an Order was signed a transition point and even just providing better urban geography and urban design outcomes with parking would be fantastic as well. Reinventing Parking provided one solution and I bet there are more as well. Resource consent should be reformed to encourage this kind of designs. The shared parking would work when all adjacent properties are own by the same owner. 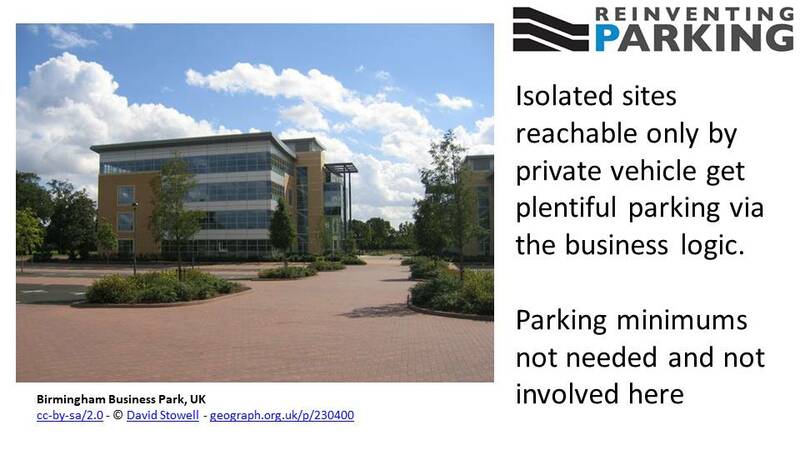 However if the shared carpark has multiple competiting owners, it could be tricky to get agreements on where it is located. Who is going to maintain it? What if one business has so many customers that use up most of the carparks? The other business may complaint about fairness. There will be a lot of issues. Bye Bye Rural Urban Boundary and Hello Infrastructure Commission?